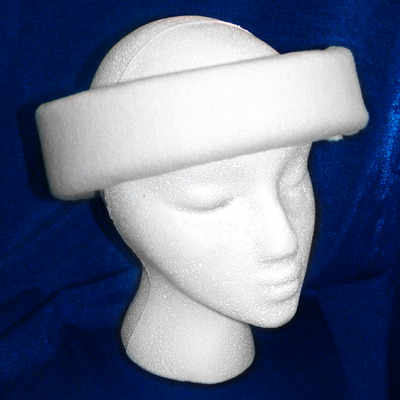 The ICE HALO is a protective head band made of a closed cell, light weight foam and covered with Micro-fleece or Faux Furs. Our patented design has been tested and proven to REDUCE IMPACT FORCE BY OVER 250 G. The ICE HALO wraps snugly and comfortably around your head and secures with adjustable Velcro closures to provide secure protection if you fall and hit your head. Why take the risk of an accidental fall in your curling game, when you're ice skating or even if you're just going for a walk in the winter. That accidental fall could result in a painful and often dangerous concussion! Studies have proven a direct link between concussions in our youth to the early onset of Alzheimer's disease and even ALS [Lou Gehrig's Disease]. The damage is irreversible, the results tragic � Protect your greatest asset � protect your head! Make the ICE HALO a part of your wardrobe � it's already used in curling arenas around the world, it's becoming mandatory for Little Rock curlers in more locations, it's hugely popular with Figure Skaters across North America, Australia and Europe! The ICE HALO is also used in daycare facilities for toddlers and pre-schoolers, by people snow tubing, skiing or snow boarding, and sleigh riding, by people with epilepsy to avoid hurting their heads during seizures, in senior citizen homes and institutions and it's ideal for anyone who fears falling or bumping their head. The ICE HALO is available in 35 different colours and textures, with adjustable X-Small, Small, Medium, and XL sizes for men, women and children. It's the perfect gift for yourself, your family and friends. The ICE HALO is comfortable, affordable, stylish, and easily the best thing that has hit the ice Before You Do! * To determine your size, measure horizontally around your head at the largest point. * If your desired color/size is not listed feel free to email us and let us know. We can special order items (additional processing 7-10 business days) and even drop ship if you need multiple Ice Halos.